If you had walked into a village in the Bay Area 200 years ago, the air would have been full of the clangs and rattles of popping acorns against mortars — “dum, dum, pop” — as women gathered to prepare acorn flour. But while acorns still drop in abundance in October and November, the sound of mortars, and the use of acorns in everyday recipes, has faded. It doesn’t have to be that way, says Olompali State Historic Park interpreter Jill Miller, who teaches a class at the park on using modern kitchenware to make traditional Native Californian comfort foods. And the oven, hammer, and food processor don’t just replace the mortars—they’re a way to connect to our modern-day landscape by understanding the sometimes complex process food takes to get to our plates. Robert Heizer and Albert Elsasser, authors of The Natural World of the California Indians, estimate that California Indians harvested more than 500 different kinds of plants and animals. Life along Bay Area watersheds afforded a wide variety of tastes–mussels, oysters, clams, geese, ducks — but the most important food was found inland scattered among the hills. Acorns formed the staff of life, the basis of nearly every meal for Bay Area Indians. California holds around 20 –depending on how you consider hybrids — species of oaks (Quercus) and one species of tanoak (Notholithocarpus), all of which have edible acorns. Heizer and Elsasser write that a large oak will yield 500 to 1,000 pounds of acorns per season. A single oak could provide countless meals but to make one bread loaf, for example, you only need one pound of acorns to make a little over a cup of flour. While all acorns are edible, many have such small kernels or high concentration of bitter tannins that they’re not worth the effort. Miller says California Indians generally preferred tanoak acorns for their taste, but worked with whatever was most abundant at the time. If you’re pressed for time or not patient enough to embark on a quest “just” for oaks, don’t worry, because prolific amounts of acorns can be found in the most unexpected places. Next time you drive to work, notice the trees on street medians and you’ll likely find enough acorns for a good meal. But, to get the most out of the gathering experience, grab an oak field guide, head to a local park, and find a valley oak (Quercus lobata), coast live oak (Quercus agrifolia), tanoak (Notholithocarpus densiflora), or California black oak (Quercus kelloggii). When gathering, look for heavy acorns that don’t have drilled holes or black spots, a sure sign of insect infestation or mold. If you’re not up for inspecting every acorn you put in your bag, the process can be simplified– as Sue Mace, a photographer for Gallinas Watershed Council who attended Miller’s November class, said, “I just put ‘em out in my driveway and let the raccoons pick out the infested ones!” However you sort them, once you’ve got a bag of acorns to your liking you can start to bring—if you wish – your modern technology to bear. What Do You Do With Gathered Acorns? Although there are a wide variety of ways to accomplish each step, the basics for preparing acorns are: dry, grind, leach, and cook. Native Californians often stored shelled acorns for one year in acorn granaries, which allowed the acorns to dry and store for the next season. The tannins in acorns act as a preservative, meaning they could be stored for up to a decade, and the edges of the granary were generally lined with wormwood to prevent insect infestation and capped with rain-proof incense cedar bark to prevent mold. Since you might not have your own wormwood-and-cedar-bark granary, you can also do what Native Californians did in a pinch: leave them out in the sun for two consecutive days to dry for brown acorns, or up to five days for green acorns. If you do not have a yard, porch, or other convenient access to sunlight, spread a single layer of acorns on the bottom of a shallow cardboard box. Although the acorns will dry faster in the sun, the cardboard box will be sufficient to wick the moisture out of the acorns in about a week’s time. Native Californians used hammerstones to crack the shells and separate the kernels. They then placed the kernels in a scoop-shaped winnowing basket and tossed until the friction of the basket’s weave removed all traces of skins, which blew away in the wind. After winnowing, the acorn’s bitter tannins were leached by soaking the kernels in cold water. Finally, the kernels were placed into bedrock mortars where women pounded pestles until the acorns were the consistency of flour. A more modern option: place the kernels in an electric blender and grind into flour. Modern methods speed the process along, although, as Miller emphasizes in her class, the more care taken, the better the meal. Miller dries her acorns on cookie sheets in the oven at 250 degrees for two hours; de-shells them with a hammer; grinds the kernels into flour with a food processor; then soaks the flour in cold water, changing the water each morning — 3 days for “sweet” acorns like the valley oak or up to a week for coast live oaks. The leached flour is then strained through cheesecloth. If you prefer a more passive approach, Charlotte Clarke writes in Edible and Useful Plants of California that enterprising souls may place a pillowcase in the water tank of a toilet to let flushing do the leaching. While this may sound unappealing, the water is clean and you’re going to flush anyway so why not wash acorns at the same time? Using cold water leaches the bitter taste without breaking down the complex starches, so if you are using the flour to bake, cold-leached flour works best. If you are in a rush, using hot water can leach the acorns in under a day’s time. Place the acorns in a pot on the stove and as soon as the water boils, pour off the water and re-fill — it will take about an hour and 5 washes. 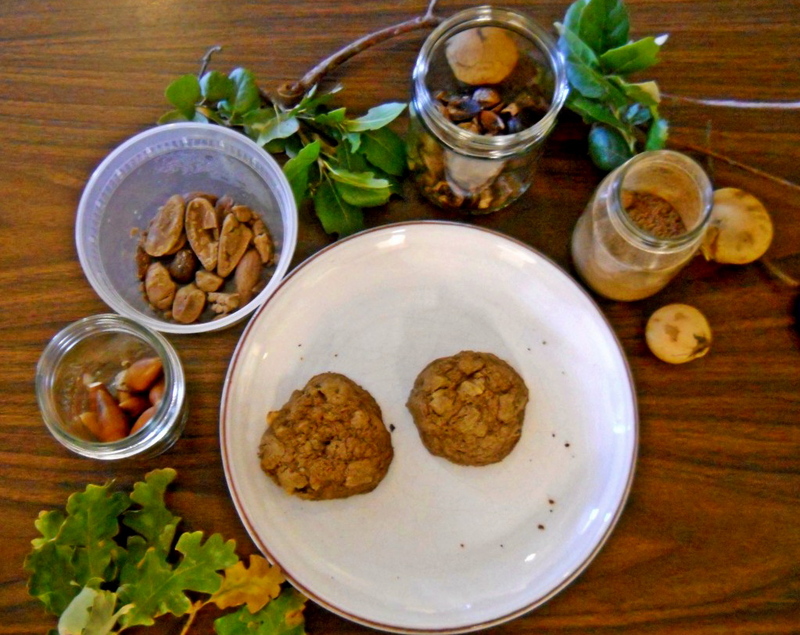 Once the acorn flour is prepared, the next step is to get creative: what do you want to make? Acorn flour can be used as a substitute for wheat flour in any dish requiring flour. The flavor of leached acorns resembles chestnuts – full and richly nutty. Depending on your desired recipe, you may want to dry your flour. This can be done in a dehydrator, oven, or the sun. Once prepared, acorn flour can be the main ingredient in cookies, breads, muffins, pasta, crepes, oatmeal, soups, and teas. After Miller’s class, I took home two types of acorns from Olompali to try raw, straight out of the shell. The valley oak, known as the monarch of California oaks for its large size, produces the largest acorns, and kernels resemble cashews in color and taste with only a slight bitter aftertaste. The coast live oak had yellow and bitter acorn meats. In Kashaya Pomo Plants, Jennie Goodrich writes that valley oak acorns were used for finer meals like breads and pancakes while coast live oaks were used for acorn gruel, similar to oatmeal, and commonly flavored by venison. There are many edible, native plants in the Bay Are that are not widely used. If you’re looking for a quicker nut to process, the California bay laurel (Umbellularia californica) nut or “peppernut” can be eaten whole after roasting or also ground into a powder to make a tea strongly resembling coffee. California bay nuts are cooked similarly to acorns –collect fallen nuts and place them in the oven at 350 degrees for 40 minutes to volatilize the bitter essential oils. Bay nuts can also be ground in a food processor or blender. I experimented and found the bay nuts to make a wonderful roasted powder. When I added a couple of tablespoons to a cup and steeped in hot water, the drink tasted smoky with hints of Cheerios, floating oils that smelled like pine needles and caffeine-like stimulant properties. In traditional dishes, Goodrich writes, foods processed from the fruits and nuts of the California bay often accompanied acorn meals or carried as a sort of “trail-mix” when traveling for long periods. The California bay is closely related to the avocado genus Persea and understandably, the fruits resemble avocados in appearance and texture. Sampling trees at Olompali, I found the large purple skinned fruits were much less bitter than the smaller green fruits, though both were ripe since they had dropped from the tree and had soft flesh. Acorns are a lot of work to process — but it’s mainly because you’re doing the work yourself; consider the fertilizer, tilling, watering, harvesting and processing needed to produce domestic wheat flour. And there’s a connection to the land you can’t get otherwise. “Observing nature closely can be a grand passion, but tasting moves that relationship beyond the platonic,” Margit Roos-Collins wrote in The Flavors of Home. “Through the medium of wild plants, the minerals of the places I love have been knit into my bones.” Native oaks grow in great abundance across the country, and whether you grind your acorns in a blender or in a traditional mortar and pestle, offer one more way to forge that relationship and truly eat local. Learn more about the Olompali People, get acquainted with oak ID, and get cooking with a 50 page instruction on acorn preparation and recipes. Or, visit Sue’s Acorn Cafe and Mill in Martinez.